Films such as Batman Begins and TV series The OC are to be made available over the internet via peer-to-peer (P2P) networks by studio Warner Bros. The firm will sell movies and TV shows over the internet in Germany, Austria and Switzerland from March. Its In2Movies service will use the same file-sharing technology that has led to an increase in movie piracy. 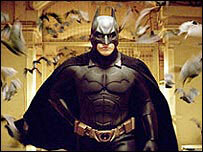 Warner Bros did not reveal price details but said it planned to widen its international use of P2P networks. Its In2Movies service will enable viewers to download legally Warner's blockbuster movies and regional programmes as well as material supplied by third parties. New films will be made available to registered users of the service from the day they are released on DVD in the German language. "Our initial efforts will focus on the German market, but in the months ahead we will leverage this technology to better serve markets around the world," Mr Tsujihara added. A later version of In2Movies will also enable viewers to store movies and TV shows on portable devices. Warner Bros said that in the first half of 2005, 1.7 million internet users illegally downloaded 11.9 million movies in Germany. The BBC is currently testing a similar service called iMP, which will enable viewers to watch BBC programmes up to seven days after they have been broadcast on TV.